Today I am bringing you a sweet treat from the Scraps to Treasure Team. Each month we choose a different project to create using only our scraps! 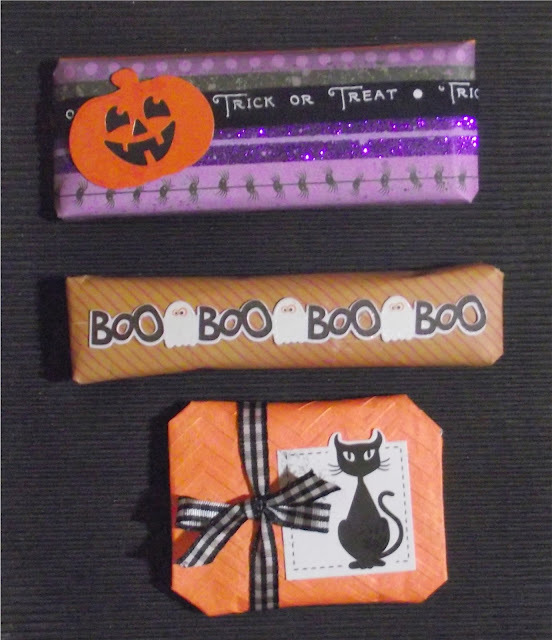 With Halloween on the horizon we were thinking sweets so our projects are Candy Wrappers with either a Halloween or Fall theme. You should have arrived here from Jearise. The hop started with our Hostess Lissa Marie (who is also our Guest Designer this month at Colorful Creations). Please make sure you started from Lissa so that you don't miss any fun projects or blog candy opportunities. First I took out the candy and then I gathered my Halloween and fall colored scraps and some embellishments. and then I got to work. I have never done candy wrappers before but they really weren't any harder than wrapping a package just on a smaller scale. I am also entering these creations in the Say It With Words Challenge at Colorful Creations! Hope that you have enjoyed your sweet treats today! Thanks for stopping by. Don't forget to come by next month (November 16, 2013) to play Tic-Tac-Toe! Incredible wraps....especially love the Boo Boo Boo. These are so cute! Who wouldn't want to get a special treat like that! I am loving the ghosts and the black cat, especially! So fun. What a neat challenge.